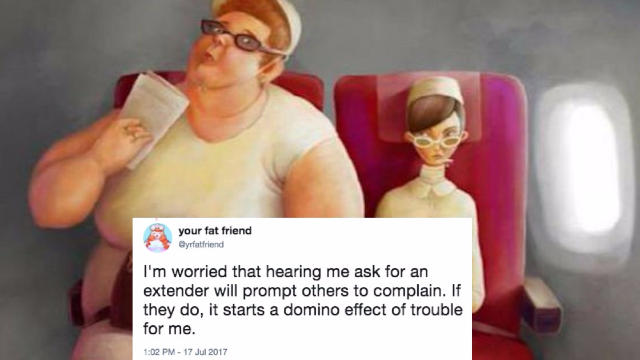 A writer and activist known as "Your Fat Friend" went viral with her tweets outlining the unique details of what it takes to board a plane as someone with a high Body Mass Index. It turns out there is a whole process for "customers of size." You never know what people are going through as you judge and snicker on your way to the airplane bathroom. I researched airlines for their "customer of size" policies, many of which reserve the right to kick me off the plane, even after boarding. The rest require purchase of a second seat. If I don't buy one in advance, I'll be charged the day-of price. Today, that's $800 one way. I'm charged for that second seat regardless of whether one is available. I pay double for the privilege of staying on the plane. Even if I buy a second seat in advance, the airline may still sell it to another passenger. If they do, I won't be notified or refunded. I bought a round trip first class ticket for this trip--about $900 more than a coach ticket, but on this flight--still less $ than 2 seats. I brought my own seatbelt extender, so I wouldn't have to ask for one. Sometimes my extender is confiscated by the TSA. Today it wasn't. I'm not worried about the embarrassment of asking for a seatbelt extender. I know I'm fat. I'm worried that hearing me ask for an extender will prompt others to complain. If they do, it starts a domino effect of trouble for me. Passengers complaining to flight attendants will get me reseated, charged double, or escorted off the plane, stranded without a way home. Over the last 2 yrs, about 50% of passengers in my row complained about me. So, my body is regularly discussed in my presence w/o my input. Some policies don't include a refund or rebooking policy. So I could be out $1300 & still stranded. That's a risk I take every time I fly. And no matter what happens, if someone complains, my body will be discussed loudly, with open revulsion, without regard for who hears it. As a very fat person on a plane, I am treated like luggage--a cumbersome, exasperating inconvenience. Inanimate & unfeeling. I also checked my bag so I wouldn't give any other passengers another reason to be irritated with me. I bought a first class tickets bc they're a bit wider, but mostly because there are partitions between seats. So complaints are less likely. Although I bought a first class ticket, and despite being ~60 lbs smaller than I used to be, the tray table doesn't fit around me. Without a tray table, I can't work for the full six hours. I also won't be able to eat the first class meal that comes with the ticket. I also won't request anything so the flight attendant doesn't have to reach over me, again prompting my seat mate to complain. So I'll sit silently, arms crossed, so I don't encroach on my neighbor's space. Today, I was lucky--I boarded & the flight took off without incident. I hope I'm so lucky on my return flight. No one likes flying. It's not comfortable for anyone. But for some of us, it's a major physical, financial & emotional risk. And this isn't about emotional fragility. I'm vulnerable, but I'm tough. This is about airline policies, and about what happens when others decide to make an issue of my body. I was complained about for the first time about six years ago. I will never forget it. I was on an oversold flight, moved to a middle seat. The man sitting next to me became increasingly agitated. I said hello, asked how he was. He didn't respond. He got up several times to talk to a flight attendant, pointing angrily back at me. My stomach sunk as I realized what was happening. When he returned, he gathered his things and said sharply, "this is for your comfort. It'll be better for both of us." The FA looked at him blankly and said "no it's not. Someone else will be sitting here." He scowled at her, then me, then moved to his new seat--directly in front of me. I spent the rest of the flight with my arms & legs crossed, humiliated and alone. No one spoke to me or made eye contact. The flight attendant didn't speak to me, but gave free food and drinks to the others in my row--rewards for tolerating my presence. No one said anything. No one interrupted him or reached out to me. I was invisible. At the end of the flight, as we filed into the aisle, the man who asked to be reseated spoke to me. "I wouldn't do that to someone who was pregnant or in a wheelchair," he said. "I know," I said. "That's what makes this so awful." I didn't fly for a year and a half after that. Refused travel for work, didn't see my family, only traveled where I could drive. I fly now because I love my family, who live about a thousand miles away. I don't know what my life would be without my niece & nephew. I fly because I value my job, & I'm good at it. & bc advancing my career means traveling. People bigger than me may not have that option. I fly because my life is my own, and others' preconceptions of me & my body won't control it. But they can make it much, much harder. If you learned something from this thread/think others might, please RT. It would genuinely help if others knew where their complaints lead.